After the release of Depeche Mode's Exciter album in 2001, the members of the band took some time off to pursue other projects. Andrew Fletcher started the Toast Hawaii record company, Martin Gore was preparing his second collection of cover tunes and Dave Gahan with the help of multi-instrumentalist Knox Chandler (Psychedelic Furs, Golden Palominos and Siouxsie And The Banshees) recorded his debut solo album Paper Monsters. The hardest thing for any long-time vocalist to do is step out of the shadow of a band they've been with for over 2 decades and create something original. For Gahan, it was expected to be easier. Depeche Mode leaned on the writing talents of Martin Gore (with the exception of Vince Clarke on Speak & Spell and a few tracks by Alan Wilder.) But for the most part, Dave Gahan has been an unknown commodity when it comes to songwriting. Paper Monsters opens with the first single "Dirty Sticky Floors" which doesn't do much to get out of the shadow except for the seedy title. More recently it seems like every Depeche Mode album has one grittier song (that is often chosen as the first single) and this seems like an amalgam of "Barrel Of A Gun" and "I Feel You" but can't fault him for playing to his strengths. "Stay" is a nice sparse production that along with "Hold On" and "Bitter Apple" are the balance of beautiful tracks the album needed. "I Need You" is a great but predictable dance track. There is an over-riding sense of darkness to the album with a lot of personal songs that seem to show Gahan dealing with his personal demons specifically on the Dead Of Night-like stomp-fest "Bottle Living" and the bluesy "Black And Blue Again." 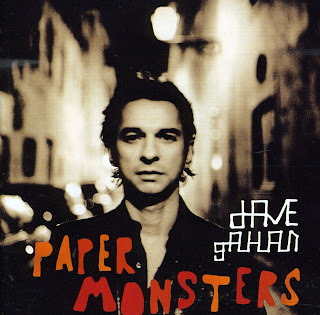 Dave Gahan set the bar high for Paper Monsters. There were some moments where lyrically he didn't get his chin over that bar but for a debut album this shows Gahan has promise as a solo artist.